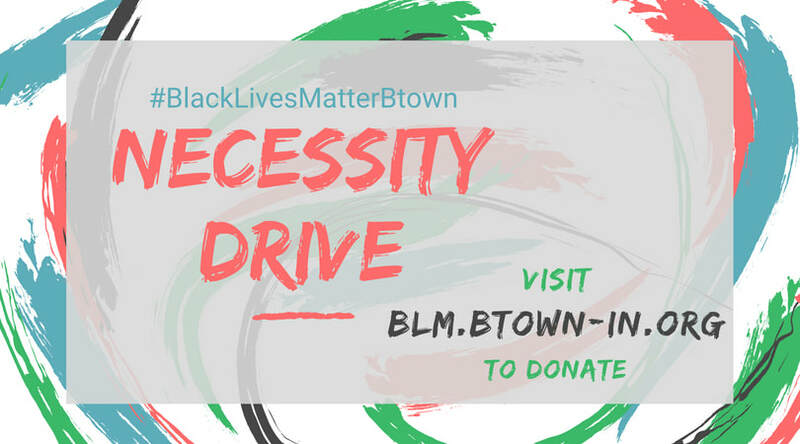 Our Fundraising & Philanthropy Committee is devoted to fund raise for BLM events and our philanthropic outreach in the community. We both partner with local organizations and groups to fund raise, while we also welcome direct contributions from the public. Any and all donations monetary or goods that we receive either go directly to organizations we are working with or are used to fund our project and event that further our mission and objectives. Continuing last year's successful Necessity Drive, BLM is collecting healthy, high-quality products for multiple non-profit organizations in Bloomington. The needs of our community change seasonally, and our periodic drives help local organizations meet the challenges they face everyday. These organizations will distribute these items to members of our community who need them. ​BLM is collecting healthy, high-quality necessities for multiple non-profit organizations in Bloomington. These organizations will pass the products we collect on to members of our community who need them. See our past Necessity Drive here. We hope to partner with existing organizations to create a pool of money and resources for local organizations seeking to help bail out Black Families and those that watch the courts for cases related to disproportionately arrested black and brown people. We seek to bring their cases and causes to the public eye and get these families the support they need to navigate through the criminal justice system.